This morning in Grand Central, Coca-Cola salespeople were handing out free bottles of Coca-Cola Blak, their new coffee-Coke-combo "energy" drink intended to compete with Red Bull. It comes in a short, skinny, 8-ounce glass bottle. Glass is a nice touch, but it's covered with a complete plastic overwrap that obscures the view and makes the bottle feel cheaper than it should. They're also appealing slightly to calorie-counters, advertising it as "about half of the calories" of regular Coke. Curiously, they've chosen to sweeten it with a lot of high-fructose corn syrup (crappy sugar) and aspartame (NutraSweet), which is usually used as a sugar substitute in "diet" drinks. This won't do it any favors. Ed Levine, food writer and blogger: "It's odd... I don't want any more of it." Adam Kuban of Slice and A Hamburger Today: "It's weird. It's like when I drink coffee right after I drink Coke. It's... not good." My opinion: It tastes exactly as I'd expect Coke to taste if I spilled some coffee into it. The regular Coke flavoring is still prominent at first, but the coffee taste kicked in after a second or two. The lingering aftertaste was the worst of both beverages, combining coffee's bitterness with corn syrup's grimy sweetness. The rest of the office refused to try it, with comments including "Uh, why?" and "That's scary." The tasters and I unanimously agreed that we would neither want to consume an entire bottle nor pay for one. 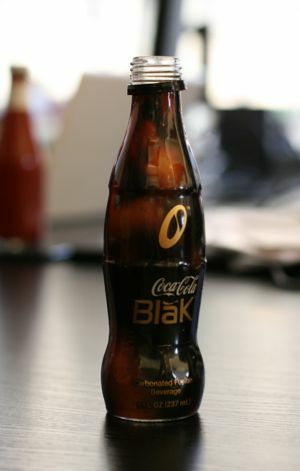 Since Coke is charging a premium, they're going to have a hard time making Coke Blak succeed.